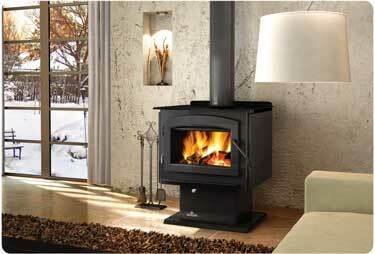 The Fireplace Element is proud to offer Napoleon's World Renown Quality wood burning system at an economical price. The Independence 1450 pedestal wood stove allows you to be free from the dependency of the Utility Companies for home heating. It's a great timing to take control of your INDEPENDENCE! The Independence 1450's upper firebox is lined with ceramic fiber baffles.